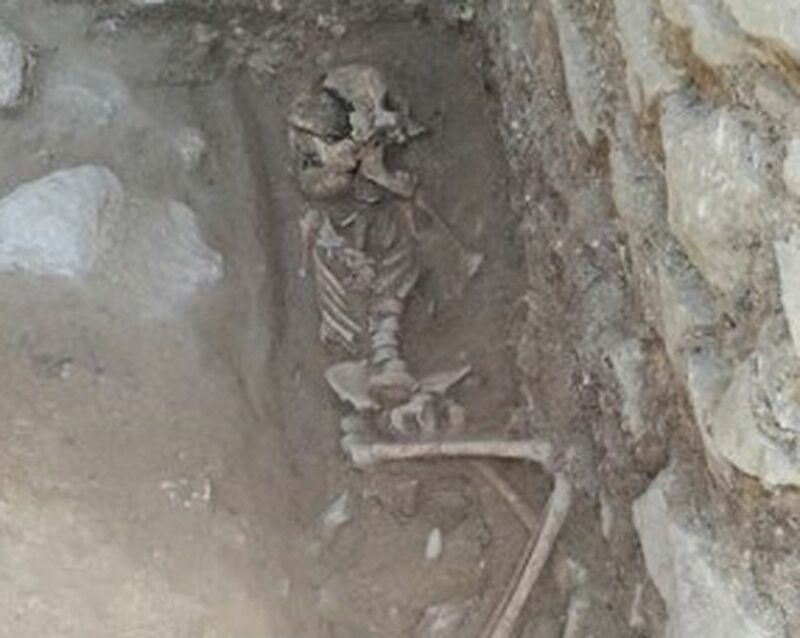 Inside a miniature tomb, in the middle of what used to be a sprawling Roman villa, is the skeleton of a 10-year-old child who died more than 1,500 years ago. It is on its side, its mouth agape and stuffed with a limestone rock about the size of a big egg. Researchers believe the child, whose gender is still unknown, died after a deadly malaria outbreak afflicted the fifth-century community that once inhabited this tiny medieval town on a hill about 60 miles north of Rome. The stone had teeth marks, leading archaeologists to believe it had been deliberately inserted into the child's mouth after death - a bizarre, ancient practice to keep the child from rising from the dead and spreading the disease. 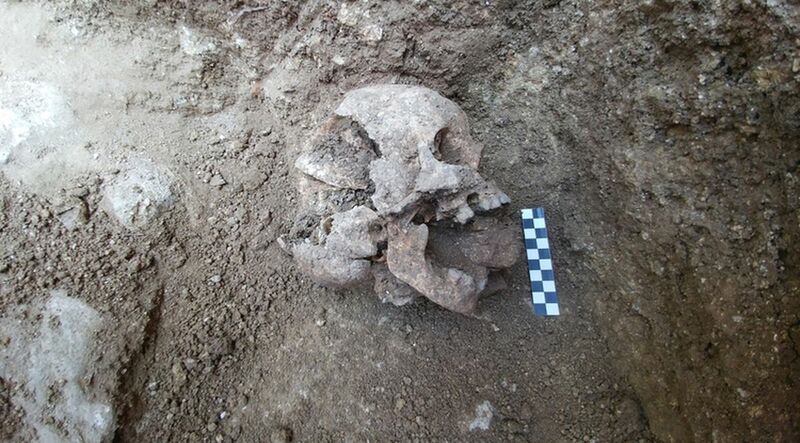 Archaeologists have dubbed these types of burials "vampire burials." Locals in the Italian town of Lugnano in Teverina call it the "Vampire of Lugnano." "We know that this kind of unusual treatment usually indicates a fear of the undead, specifically, a fear that the dead might come back from the grave to continue to spread diseases to the living . . . Placing the stone in the child's mouth is a literal or symbolic way of incapacitating them," said Jordan Wilson, a bioarchaeologist and a University of Arizona doctoral student who was part of the team that unearthed the remains in the summer. The discovery is the latest among several dozen remains that have been found at La Necropoli dei Bambini, or the Cemetery of the Babies, an abandoned Roman villa that was turned into a massive children's graveyard sometime in the middle of the fifth century. A community on the cusp between paganism and Christianity, horrified by deaths they couldn't explain, resorted to witchcraft and buried their children through ritualistic means, said David Soren, a University of Arizona regents professor who has been overseeing archaeological excavations at the site in the last three decades. These discoveries offer a glimpse into a terrified society swept by a deadly, unknown disease. Archaeologists say it may have paved the way for the end of the Roman Empire and even kept barbarian ruler Attila the Hun from finishing his invasion of Italy. "It must have been a situation where you don't know what's happening, you have no idea . . . where you're almost trying anything in desperation and listening to whoever can come up with an answer," Soren said. "It's just genuinely eerie." Soren said he first found out about the burial site in 1987, when he was working on a different project on the island of Cyprus and was invited to visit Lugnano in Italy’s Umbria region - the center of witchcraft during the Roman Empire. There, he saw what was left of the villa, about the size of a modern-day shopping mall. They found remnants of what had been a pyramid-shape dining room, slaves' quarters, a ceiling that sloped on four sides, paintings and wall mosaics. Amid dirt-covered trenches were the remains of infants, toddlers and aborted fetuses that had been buried alongside raven talons, toad bones, bronze cauldrons filled with ash, and sacrificial puppies. Archaeologists call these "deviant burials," or the ancient way of burying people who were feared to have supernatural abilities like coming back from death, or those who have violated society's rules, Wilson said. "They're sprinkling honeysuckle all over the place," Soren said. "There's all these magic rites that are going on around this, which makes this cemetery so fascinating." Soren and his team of archaeologists have since excavated 51 remains of children proven through biomolecular tests to have died of malaria, and fetuses believed to have been doomed with the disease before birth. The oldest child to date was the 10-year-old whose discovery was announced last week. Researchers have not done further analysis to determine if the child had died of malaria, but evidence of an abscessed tooth, a side effect of the disease, suggested that was the case. Near the child's grave was the body of a 3-year-old girl, archaeologists say. Her hands and feet had been weighed down with stones - another form of a vampire burial to keep the evil away. She, too, had died of malaria. The urbanized Roman Empire was a cesspool of diseases that spread through contaminated food and water. Swamps were a haven for mosquitoes, creating a ripe environment for malaria that would remain undiscovered until the 19th century. Lugnano is not the only site of vampire burials. In Venice in northern Italy, an elderly 16th-century woman, who was buried with a brick in her mouth and discovered in 2009, had been dubbed the "Vampire of Venice." In Northamptonshire in England about 75 miles north of London, a man from the third or fourth century was found last year, a stone sat where his tongue had been. But beyond these bizarre discoveries were human beings who lived in fear, Wilson said. "It's something that I thought a lot of while we were working on this project. It seems when humans are faced with the unknown, it's been a very common reaction throughout our entire history to react with fear," Wilson said. "I really feel deeply for this community that was dealing with this epidemic when they had no understanding of it." And caught in the middle of this fear were the children who died in pain.